Cajun seasoning isn’t too spicy so I added a bit of ground ghost pepper for heat…you can add as little or as much as you want. These Cajun steak tips are also easy to make and can be on your dinner plate in about 10 minutes. I make this with a side of greens like a buttery, garlic spinach or steamed broccoli with butter or bitter broccoli rabe. You can even have these as an appetizer for a few people, just wash it down with ice cold beer! Enjoy! Cut steak into 2 inch cubes and pat dry with paper towels to absorb any excess moisture. Add Cajun seasoning, pepper, and salt in a small bowl and mix well. Sprinkle over steak and rub in the seasoning making sure all surfaces of the steak are covered. In a cast iron skillet or heavy bottom skillet heat olive oil on medium heat. When hot, add steak. Cook for a few minutes. Add butter and turn each piece of steak until all sides are well browned on each side. About 2-3 minutes each side. Sunday nights are my movie nights; a time to relax and get ready for the rest of the work week. This weekend has been especially hectic with the 4th of July long holiday weekend festivities here in the states and tonight I would rather just kick back, and relax. It’s a movie night for sure with my quick and easy go-to spicy Cajun popcorn. No prepping, not much thinking, just pop your regular popcorn and kick it up with a little seasoning. I picked up great Cajun spices during my visits to New Orleans but I’m sure that whatever you have in your cupboard will do! So while I wait another year for the next season of Games of Thrones, I’ll be catching up on whatever is on tonight until The Newsroom season 2 comes back next week! Great TV goes well with great snacks so get out your spices, popcorn and an icy cold beer! You can also try other seasonings like garlic powder, or melt a tbsp of butter with you favorite hot pepper flakes and pour over your popcorn! Two weeks ago I posted about a little hidden, spicy foods gem down the shore here in Jersey called Ragin’ Cajun. 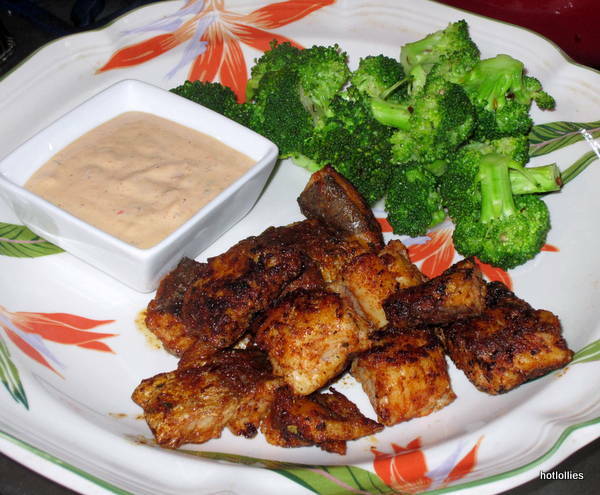 I picked up their cookbook the last time I was there and had to share this recipe for blackened fish bites. If you visit you’ll see the blackened chicken bites on the menu but I had a few filets of Whiting and decided on blackened fish bites. I’m posting this one because it’s one of the recipes posted on their website so not divulging too much from the book, you’ll have to go buy your own copy to get the rest of the goods! Blackened just means you cook it until it looks nice and burnt but it’s not! Actually, you’re cooking at high heat and toasting the seasoning which brings out a wonderful smoky flavor. Also you want to be sure to use a cast iron skillet because of the high temperature but if you don’t have one use a heavy bottom pan instead, that will work just fine. Make sure you have a good Cajun seasoning as well because the only other ingredient is butter so your spice flavors should be well balanced. 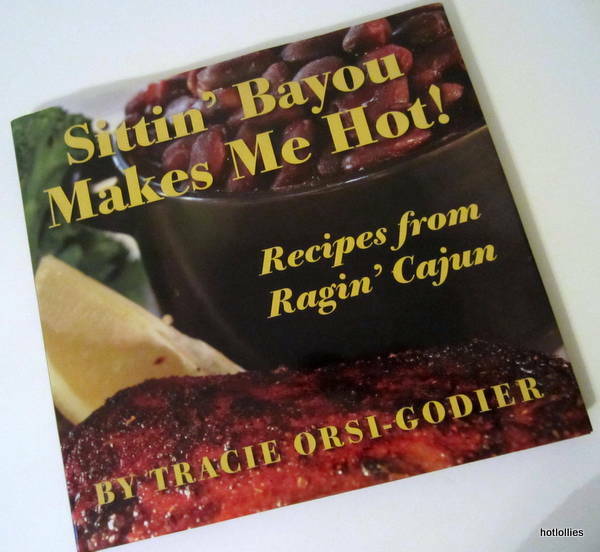 As an added bonus the book purchase came with a free jar of Ragin Cajun’s very own Cajun seasoning so I was pretty set, no way to mess up this recipe! Check them out and let me know what you think! 1. In a bowl, toss the fish bites with the seasoning. 2. Melt butter in a cast iron skillet on high heat. When butter melts and add the fish. Cook for 2-3 minutes on each side making sure the fish is well coated with butter. 3. Serve as an appetizer or add a side veggie for dinner. I cooked broccoli in a little butter, minced garlic clove and red pepper flakes with a side of spicy remoulade sauce for a nice meal.